S/mileage’s previously untitled fourth single has finally received a name. In contrast to their previous two singles, the title of the single is considerably shorter. Titled Short Cut, it doesn’t really give a lot of indication as to what kind of sound we’ll be expecting from their next single. The single will be released in four different limited versions and a regular. In an interesting turn of events, each version of the single will have a different coupling track. It’s an interesting marketing technique being applied by UFA. I’m interested to hear what each coupling track sounds like. The single will be released 9th February 2011. I wonder what coupling track will be available on iTunes? I can’t afford to ship in physical copies of H!P singles so I’ve been buying them off iTunes. It’s a very good marketing technique and one used by Johnny’s and almost avery major avex artist. I’ve never understood why Hello! Pro don’t do this. Let’s hope it sells a whole lot more than usual and opens their eyes to the power of multiple c/ws! They did it with Nanchatte Renai back in 2009 and arguably, it worked spectacularly for Morning Musume as it’s their best selling single of the past two years. I’d like to see something like this done with Morning Musume’s future singles. It would make for some very interesting promotion. S/mileage were issued a challenge by Tsunku around a month ago – if they could collect 10,000 photos of fans smiling through mobile, web and physical submission, their major debut would be confirmed. If they could not achieve this their future would be unclear. 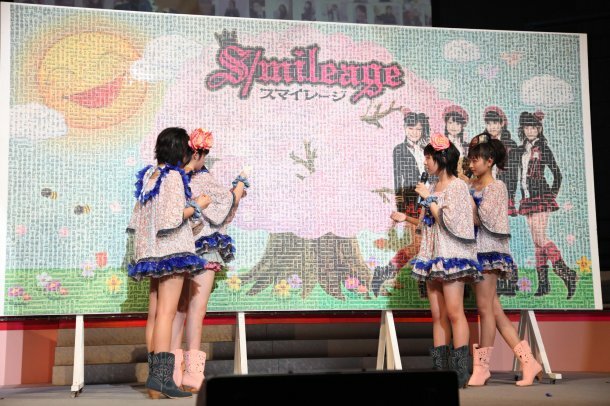 This challenge was pretty much a sure thing and sure enough, S/mileage succeeded with around 16,000 photos collected. As such, they will release their major debut single in May, star in a stage play in August and have their own tour later this year. Well done girls, let’s hope you’re an interesting group! 16,000 photos were collected. It is too much but I like it…. eeeehhh so they never did make the mural for it?? It was announced yesterday that C-ute will release their 11th single this coming 2010-01-06 – the first major Hello! Project release of the new year. It will also be the group’s first single as a 5 member group, I’m hoping it’s something a bit more enjoyable than everything they released in 2009! The single is titled SHOCK! S/mileage will release their 3rd indies single entitled スキちゃん (Suki Chan) this month on 2009-11-23, the group will most likely make their major debut next year though as their indie singles are published on TNX it’s unclear if they’ll debut under Hello! Project or TNX – I’m hoping Hello! Project! like YAY! i hope S/mileage’s new single is as good as the last one. Asu wa Date na no ni, Ima Sugu Koe ga Kikitai long name for an awesome song. It has been announced today that S/mileage will release their 2nd indie single on 2009-09-23 with the title あすはデートなのに今すぐ声が聞きたい;Asu ha Deeto na no ni Ima Sugu Koe ga Kikitai; Even though we have a date tomorrow, I want to hear your voice right now. Sounds like it could be a mature sounding song! Previews are bound to come soon! There is one small preview out already. It’s a video of the girls dance practice, with a small song preview in it. still, i`m looking foward to this single.